A stray cat paws through a heap of refuse between blocks of flats in Harare's upmarket Avenues area, sending rats squealing and scurrying for cover among the rubbish. Across the road, cars take turns to skirt a swelling mound of garbage nearly blocking one of the two lanes. Informal dumpsites have become a familiar sight in sections of Harare where residents are resorting to emptying bins in open spaces as the municipal authorities fail to collect refuse, causing residents to fear disease outbreaks. The ubiquitous heaps are breeding grounds for rats and mice, posing a health threat as the rodents sometimes find their way into homes. People are seen walking past a heap of rubbish in Harare's Mbare suburb. Local authorites have not collected the garbage over the past few months resulting in the increase of rats in the capital. Combined Harare Residents' Association has warned of possible disease outbreak if the refuse problem is not addressed. 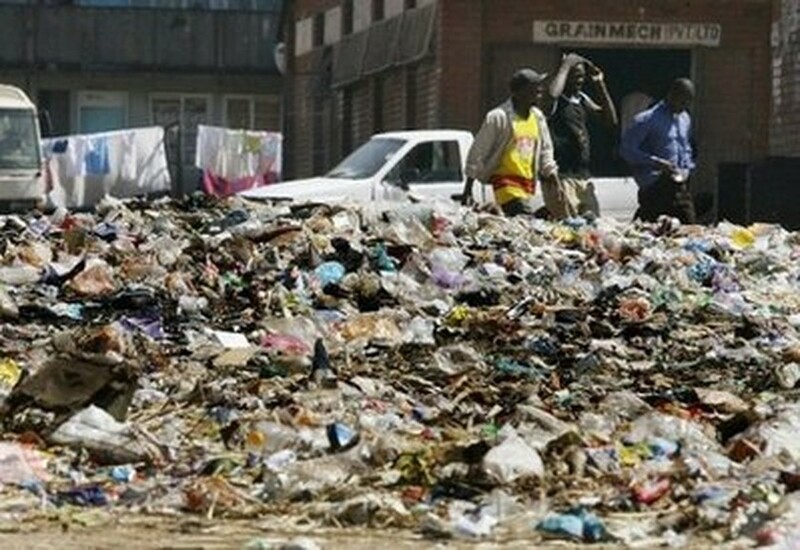 "In areas such as Mabvuku, residents say refuse was last collected in February 2009," the association said in statement, referring to a township in eastern Harare where five people died in a typhoid outbreak in February which affected scores of residents. "The piles of refuse have provided conducive breeding grounds for mosquitoes and rats and residents fear for their health." Rats can spread diseases through droppings, some of which could be life threatening, including salmonella, diarrhea, vomiting and fever. Humans can also contract ratbite fever from a rat. "You can't blame the people who are dumping the rubbish here," Jennifer Mazhawidza, a street vendor said pointing to a heap of garbage blocking a sanitary lane. "The municipality should do something about it. They charge levies for collecting refuse but they don't provide the service. Now there are rats everywhere because of the rubbish and we may have another disease outbreak." Municipal authorities collect a monthly levy from residents and companies for refuse collection. But residents like Tapiwa Ndenda from the populous township of Chitungwiza cannot recall the last time municipal dumptrucks did rounds in his neighbourhood. "If the trucks came this year, it's not more than three times," he says after looking to the sky trying to remember when he last saw the dustmen in the now-rare orange trucks in action. "We sometimes have these big rats which can easily be mistaken for kittens." Chitungwiza recorded the first cases of cholera during an outbreak in 2008 which claimed at least 4,000 lives and affected around 100,000 people across Zimbabwe. The outbreak was contained last year with a heavy injection of international aid, although sporadic cases are still reported. A woman who works for a pest-control company said demand for rat-baiting services has surged. "We get more calls from people wanting to rid their houses of rats than we used to. It's because of the rubbish that's everywhere," said the woman who declined to give her name. "At my own house I put rat poison and a few rats die, but I keep seeing one every time." Godfrey Chikwenhere, a rodent control specialist at the government's research and extension services said his department was receiving frequent requests for help to get rid of rats. "We are receiving reports that rodents are on the increase," said Chikwenhere, who was part of a research team that undertook a study in the southern Africa on the problem of rodents. "How that relates to incidence of human disease still needs to be researched on." Let down by the authorities, residents and civic groups are teaming up in clean-up campaigns to clear away the informal dumpsites. "However the dumpsites are sprouting again as the city has not complemented the efforts of the residents by collecting refuse," the residents' association said.